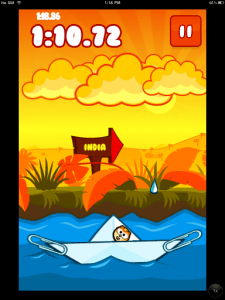 Don’t Fall Off is a game based on a little roly-poly animal, called Rollie funnily enough, who decides that he wants to take a trip around the world in a paper boat. Putting aside the kind of ridiculous context of the game, it seems like one of those incredibly addictive apps, so does it have the makings of one of those popular casual games that keep you coming back for more? Don’t Fall Off makes use of the gyroscope function of the iPhone and iPad and that’s pretty much the only control you’re going to need to worry about, apart from every so often tapping the screen. 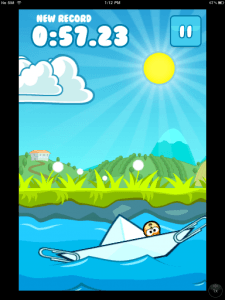 There’s a small paper boat that you have to keep Rollie on, by tilting your device from side to side. But that isn’t the only thing that you’ve got to deal with. Clouds come along every so often, and the raindrops are so strong that they make Rollie fall off the side of the boat. Poor guy, he’s like the Wicked Witch of the West. In a somewhat less Wicked Witch move, coconuts and lava also throw him off, which is quite understandable. There are bonuses that help you out with protecting your Wicked Witch Rollie from those terrifying raindrops, such as the power to vaporize raindrops, sunshine and umbrellas. These pop up randomly on the screen, to activate them you touch them and then the sunshine gives you a short reprieve from those dang raindrops, and the umbrella protects his poor little head. 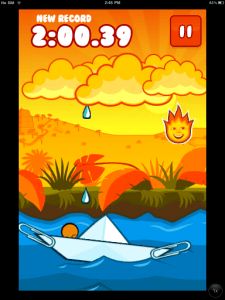 You are scored depending on how long you can stay on the boat, which is why there are no checkpoints in the game so you better get used to the first couple of levels. 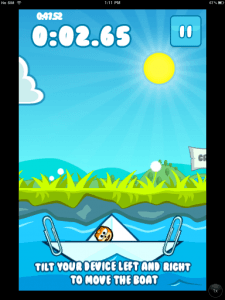 In the beginning you are given little paperclips on the edges of your boat which stop Rollie from rolling off, which gradually lower in angle until he loses the training wheels completely and is allowed to roll around the boat at will. Not that you spend a lot of time taking advantage of the paperclips anyway, because after your first go around you shouldn’t need to use that crutch at all. In regards to whether or not this is one of those apps that don’t need a complex storyline or gameplay to get you obsessed with it? Well, for me it fell a little short. The bonuses weren’t super interesting or that incredibly useful, I didn’t really care about getting them or not they were just something that turned up every so often. The controls were so easy that most people will be able to grasp them quite easily, but they’re almost too easy. There’s nothing with an interesting challenge there. I mean, sure, there’s the idea of beating people’s times, but the game needs more than just the competitive nature of people to bring you coming back again and again. There’s just that little missing element which leaves it falling short. The soundtrack sounds like something out of the Beach Boys, because you’re surfing the waves on a boat, get it? The soundtrack isn’t annoying or super in your face, it’s something that you can listen to pretty easily. Which is more than I can say for some apps. Unfortunately this seems to be one of the better aspects of the app at the moment. 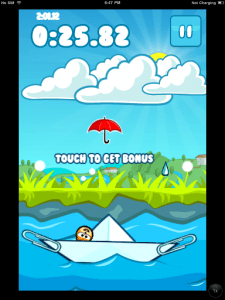 Don’t Fall Off seems to have the ideas and feel of one of those popular casual apps that keep you coming back time and time again. However, it just doesn’t make the cut in terms of bringing the addictive nature that makes casual apps so damn popular. Don’t Fall Off still remains a game that you will give a few goes, but ultimately lose interest in because there just isn’t that much progression in the game. But if you’re looking for an app which is easy to get going and can be done in short bursts (although you’ll be wanting for the short bursts to be long, since that’s the whole point of the game) and you enjoy tilt games then you may enjoy this game.